After the two early mornings at Monument Valley and Grand Canyon, we took it nice and easy yesterday morning in the Cannonvile KOA site and did homely stuff like cleaning (our clothes and ourselves) and recharging batteries (our cameras and ourselves) and intended on catching the setting sun in the Kodachrome Basin which was 9 miles down the road from our campsite (a small note about KOA so far our experience of them is truly wonderful, they have all been clean, well maintained and staffed with really friendly, helpful people) however after picking up on a severe weather warning we changed our plans and decided to drive to Bryce Canyon instead. (clicking on the piccie will take you through to the flickr page - sorry I didn't do this earlier for you, dear reader) Bryce is stunning. 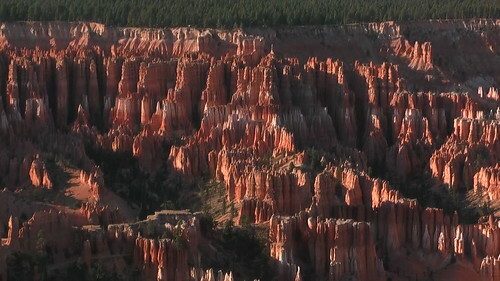 The "hoodoos" that proliferate the park make Bryce a unique visiting spot. Remeniscent of gothic spires, it's easy to compare it's skylines to a manic organic version of the universities of Oxford, except it fills the horizon and then some. We ate at the local restaurant Clark's in the small town of Tropic. The food was pretty good, service was friendly and, once again the portions were immense. Miko ordered (thinking that we were back in England) a 1/2 BBQ chicken, which the left overs have been steadily feeding us for the last couple of days - in fact there's still some left. I had a "New York steak" which was the smallest steak on the menu weighing in at 10oz and it came as rare as I requested it; can't complain about that. ;) They also have a selection of home made pies for dessert, that we took to go - along with the mutant chicken left overs that must've weighed in at about 3lbs. After the non arrival of the storm (it sure was windy though), the next morning we visited the Kodachrome basin State Park which got it's name from the early visitors who were stuck by it's beauty and colour that they called it Kodachrome. When it became a state park with that name Kodak initially baulked at the idea and it was renamed to Chimney Rock State Park but after someone in Kodak's Marketing dept realised that this was free and positive advertising, they relented and granted permisson for the trade mark to be used. Sure is pretty and it's worth every cent of the $6 entrance fee. However our next stop would make us re-evaluate all superlatives we'd used so far. 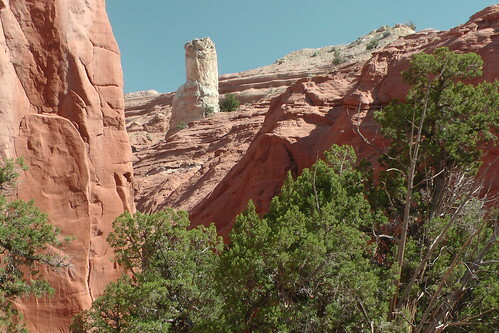 How can you sum up Zion State Park? Does this image help? Or this? This? How about this? They're all of Zion, but none of them can sum up the magnificent beauty of this place. It redefines the word "Awesome". Miko described it as "The most beautiful place she'd ever seen". We did four of the shorter suggested trails around the park (there are several trails in various levels of difficulty and length) and each one of them was completely rewarding - a simple 1 mile walk between two of the sites took us a good 2 hours to traverse, not because of the roughness of the terrain, but becausse we kept stopping to try and capture scene after vista after picture opportunity. I can only urge everyone to go to this incredibly stunning and awe inspiring place. We're now resting up in the rather plush Desert Rose Resort in Las Vegas, Nevada (the fifth state and third time zone) as a little piece of luxury and respite before we take on our final leg of California and the Forests of Sequoia and Yosemite before finishing our trip in San Francisco. Tomorrow will be a driving day (400 miles) but today will be trying to make sense of one of the weirdest cities in America.